I feel a bit of a doom and gloom merchant this week. Yesterday it was the end for the loaf of bread and today it is the announcement that coffee may run out by the turn of the century. It appears that coffee, bananas, sweetcorn and kidney beans all risk being in shorter supply because of the impact of climate change and intensive farming. Up to a third of the land used in Africa to grow bananas and maize and two thirds of land for beans will be unviable by 2100 and as early as 2025, that's nine years away, these crops will need to to replaced by tougher crops such as root vegetables and drought-resistant grains like millet. Coffee production is likely to be drastically affected too, according to experts at Kew's Royal Botanic Gardens. 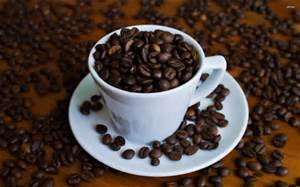 Coffee production in countries like Ethiopia is already being affected by climate change and only the development of new areas of plantation can counteract this, say the experts. In addition to the changing climate, is the growth of invasive plants such as Japanese knotweed and cheatgrass. Globally, 5,000 species of such plants have been identified. These alien plants cost the UK £1.7 billion a year. Also modern farming methods have tended to prioritise species with the highest yield, which has led to a dramatic reduction in the number of old varieties of fruits, vegetables and cereals in existence. A US study has found that the number of varieties shrank by 93% during the 20th century. So what does it mean for you and me - to start storing coffee? 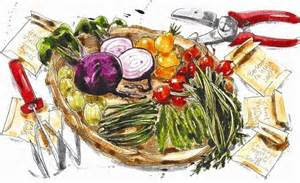 Well, my biggest food problem at present is to stop those damn slugs eating my young fruit and vegetable plants and thereby guarantee me a bumper allotment harvest this summer! That's as far a I can think ahead at the moment.